This is an oldie, but I stumbled across it last night and remembered working on it years ago, so I thought I’d share it… again! I shot this photo at Sitka National Historical Park (a.k.a. 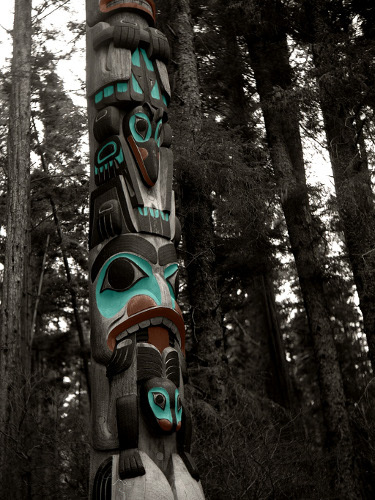 Totem Park) in Sitka, Alaska. This park is Alaska’s oldest national park, created in 1910 to commemorate the 1804 Battle of Sitka, and has dozens of totem poles and other totemic art lining its pathways. It’s really a beautiful park to walk through and I’d highly recommend visiting it if you ever find yourself in Southeast Alaska. The original photo was shot on medium format film with my old Yashica-MAT LMcamera, then I scanned it and added the color digitally based on the original colors on the totem, with a few artistic tweaks here and there. This entry was posted in Black + White, Projects, Travel and tagged Alaska, sitka, sitka national historical park, totem, totem park, totem pole, totemic art. Bookmark the permalink.